As a versatile and energy efficient roofing system, your vergola enables you and your family to enjoy a comfortable outdoor space all year round. However, like any external area of your home that’s exposed to the elements, it can quickly become dirty and grimy. That’s why it’s important to clean and maintain your vergola on a regular basis. As the only preferred cleaning contractor to Vergola (NSW), Outdoor Cleaning Specialists has years of experience cleaning many different types and styles of vergolas throughout Sydney. We use a soft, non-abrasive washing technique to ensure there’s no damage to your vergola surface. This involves a specialised environmentally friendly cleaning solution, super soft brushes and low-pressure water. Regular vergola cleaning also helps maintain the quality and integrity of the surface, helping to extend your vergola’s life. This is particularly crucial in coastal areas, where the damaging effects of corrosive airborne salt deposits can cost you significant amounts of money. 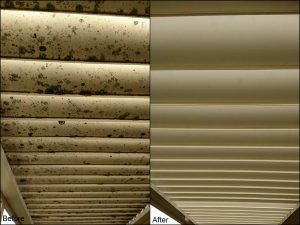 Looking for vergola cleaning Sydney?